In June 1854 on the Bristol & Exeter Railway a broad gauge steam train set an out right speed record of 82 mph that appears to have stood until July 1934 when a Milwaukee Road class F6 recorded a top speed of 104 mph to become the fastest steam train. The year before the Wright Brothers made the first controlled powered flight William K. Vanderbilt recorded a top speed of just over 76 mph aboard his Mors in 1902 to set the first Land Speed Record for a vehicle powered by an internal combustion engine, the following year AEG and Siemens & Halske built an electric train that recorded a top speed of just over 130 mph. 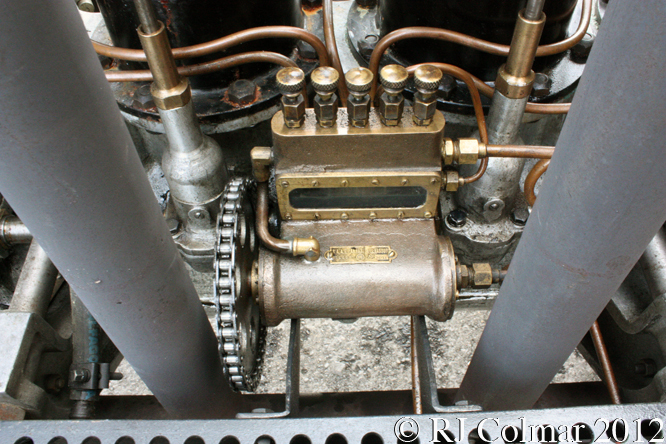 Having pioneered the Panhard System of placing the engine in front of the automobile and driving the rear wheels with the aid of a clutch operated gearbox and pioneered the use of a steering wheel in place of the hitherto ubiquitous tiller steering Panhard et Levassor were vying with their former collaborator Gottlieb Daimler to supply the best vehicles in Europe to Royalty and industrial leaders at the turn of the 20th Century. 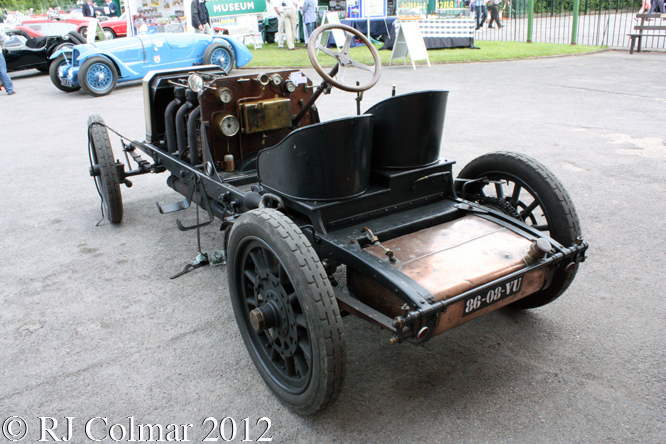 To ensure their clients awareness of it’s products Panhard et Levassor took part in the popular city to city races of the day, Émile Levassor crossed the line first ahead of another Panhard et Levassor in the 1895 Paris Bordeaux Paris race, but the cars only had two seats, four seats being mandated for prize eligibility. 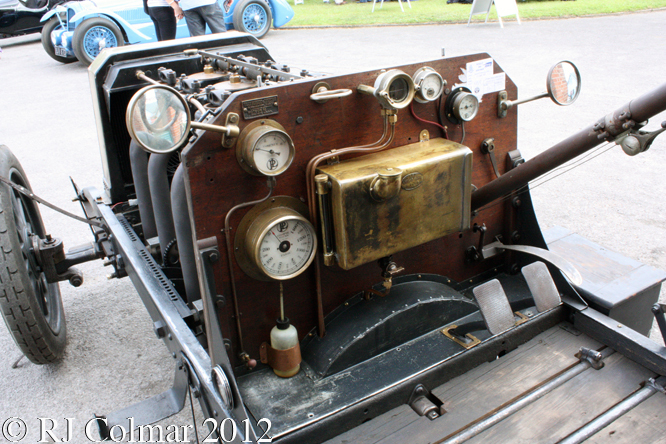 By 1903 Panhard et Levassor had developed it’s 70hp model to compete with the Mercedes Simplex. 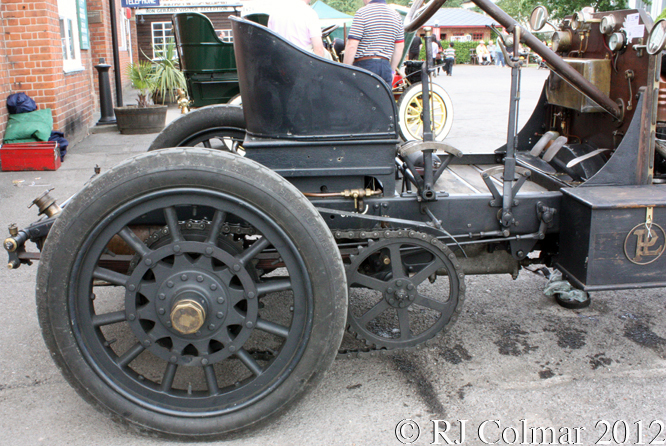 The 13672 cm³ / 834 cui 70 hp S²4M 4 cylinder motor and chain drive train was fitted to an R chassis along with two seats and a fuel tank and enough space to carry a few spare tyres. 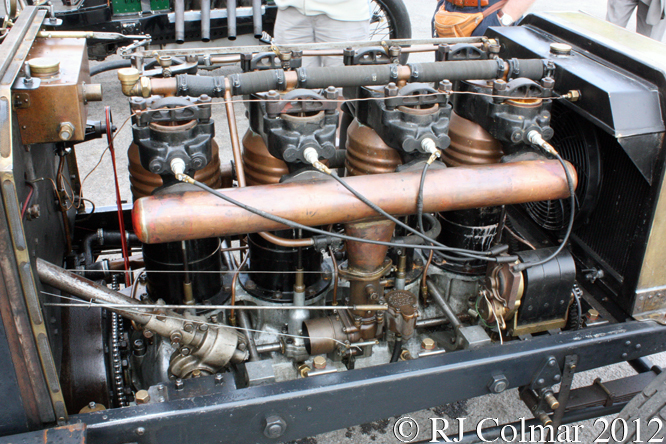 16 70hp Panhard et Levassors are believed to have been built, I believe Charles S Rolls, of Rolls Royce fame, drove one in the fatal 1903 Paris Madrid race, but retired before the race was abandoned at Bordeaux and city to city racing was banned in France. 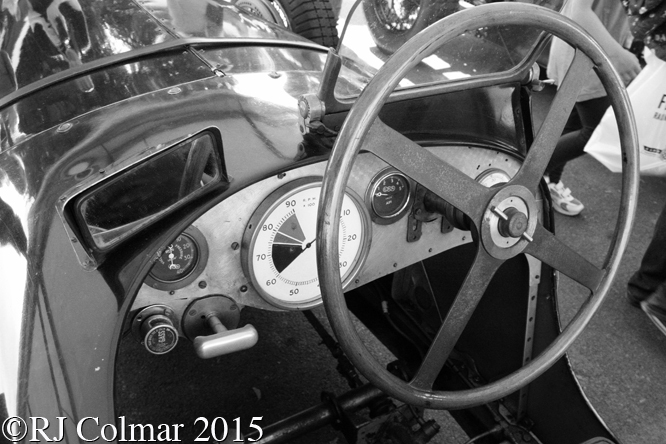 Felice Nazzaro won the 1km flying sprint at Florence in June 1903 aboard his 70hp and 2 days later won the La Consuma Hillclimb in the same car, a week later Baron Pierre de Crawhez won the 500km Circuit des Ardennes driving another 70hp and Felice rounded out his season with a win in the 10km Padua-Bovolenta Sprint and flying 1km Padua Sprint in October. 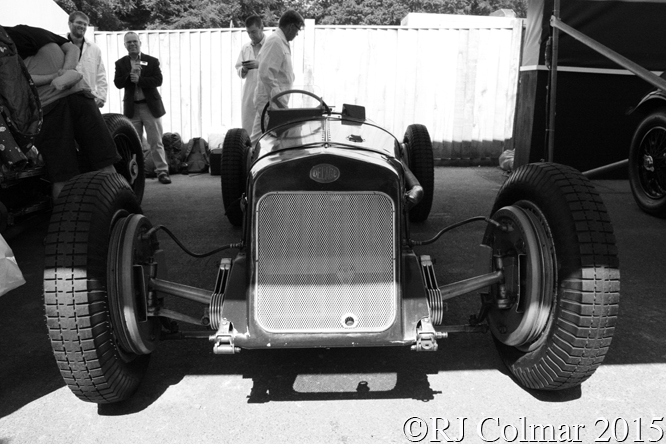 Richard Black’s 70hp, seen in these photographs at a Brooklands Double Twelve meeting with Michael New at the wheel, was first registered in the UK on the 1st of October 2007. 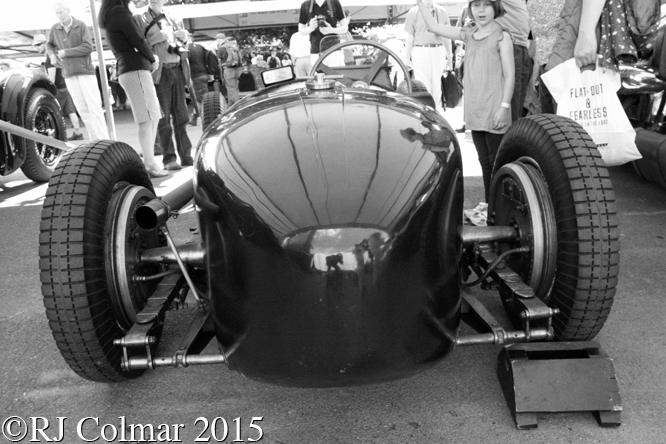 This entry was posted in Uncategorized and tagged 70hp, Black, Brooklands, Colmar, Crawhez, Double, Levassor, Nazzaro, New, Panhard, Psychoontyres, R, Ralph, Rolls, S²4M, Twelve on January 5, 2016 by Ralph. 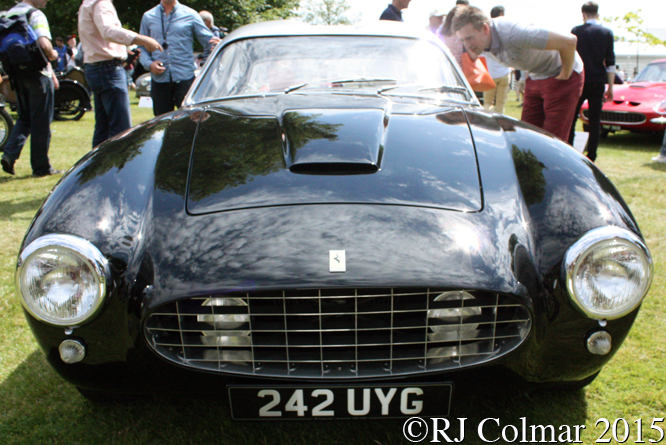 In 1955 Ferrari built the first of four series of Long Wheel Base 250 GT Berlinetta’s the last of which was built in 1959. 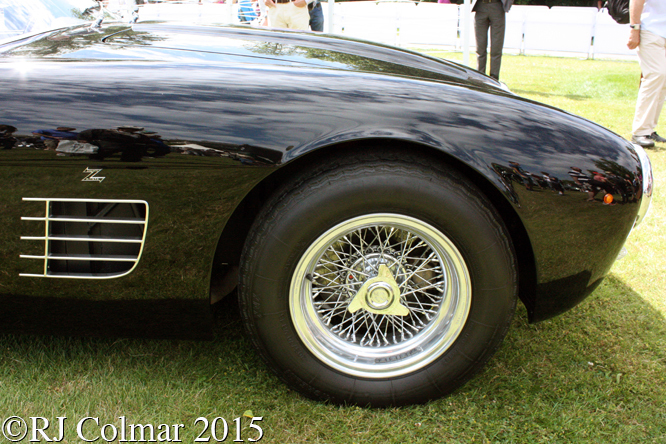 It is believed seventy nine of these Berlinetta’s were built and all bar five of them with bodies by Scaglietti with either: no, one, three or 14 louvres in the C – pillar. The remaining five became the second model, after a one off 166, to receive bodies from Ugo Zagato in Milan that featured Zagato’s signature double bubble roof line. With more billionaires with an interest in Ferrari’s now than ever before and the price of a genuine 250GTZ well into eight figures, in the unlikely event one can find one, it is perhaps not surprising that several lesser Ferrari’s have been fitted with replica Zagato bodies. 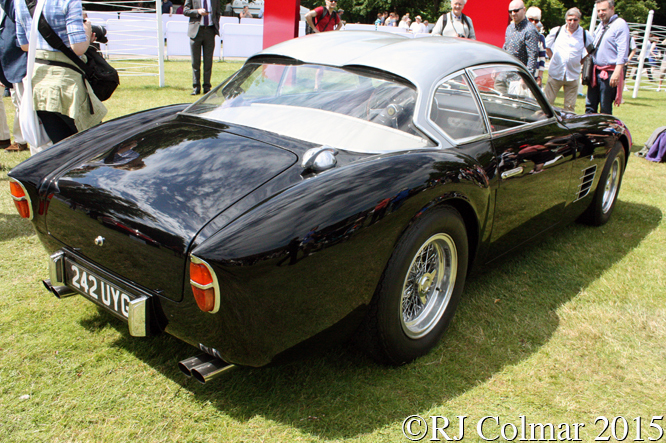 In 1990 Zagato in Milan even fitted a double bubble body to the Long Wheel Base 250 Berlinetta #0757GT which became a 250 GTZ, with the correct chassis, engine and running gear. 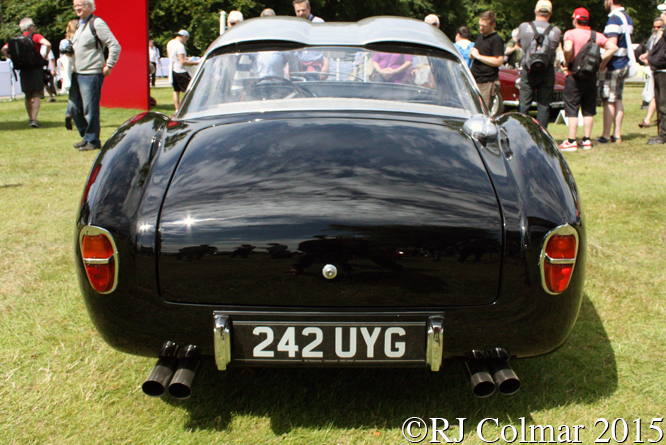 The look a like Double Bubble body on the 1962 250 GT/E #4019GT, belonging to James Cottingham of DK Engineering, seen in these photographs at Goodwood Festival of Speed is uncredited. 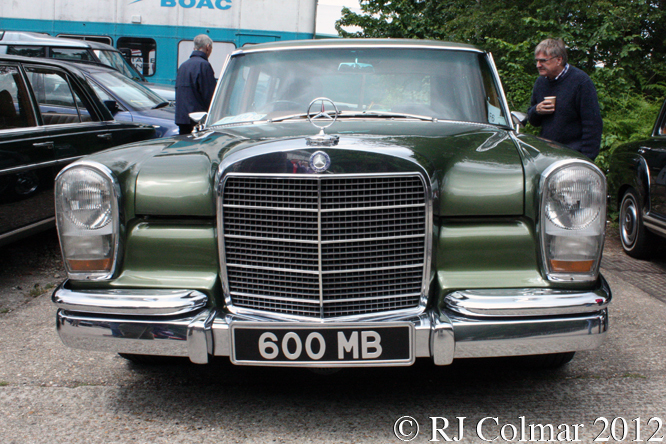 James notes his car does not have the correct running gear and it appears to be devoid of the chrome louvre trim on the bonnet seen on the genuine 250 GTZ’s. 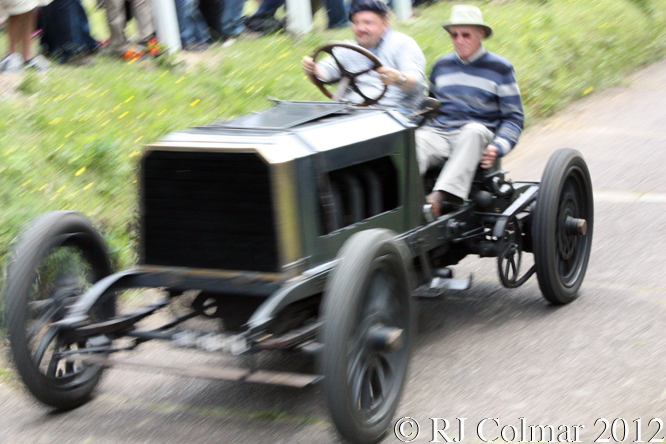 Thanks for joining me on this “Look A Like” edition of “Gettin’ a li’l psycho on tyres” I hope you will join me again tomorrow when I’ll be looking at the first in a series of Super Saloons. Don’t forget to come back now ! 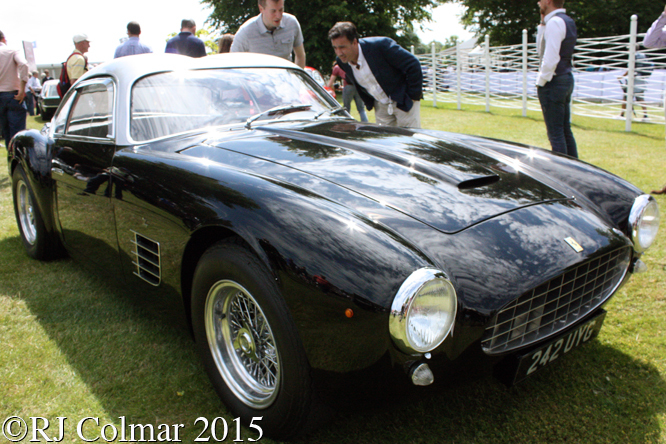 This entry was posted in Uncategorized and tagged 250, Berlinetta, Bubble, Colmar, Cottingham, DK, Double, Engineering, Ferrari, Festival, Goodwood, GTE, GTZ, LWB, of, Psychoontyres, Ralph, Speed, Zagato on December 4, 2015 by Ralph. 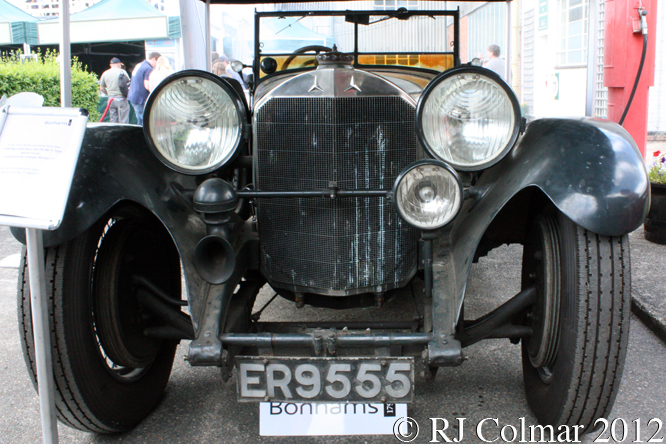 The original of today’s featured 1928 Mercedes Benz 36/220, Charles Gerald Brocklebank, is known to have competed with a Mathis in pre-World War 1 Oxford University Motor Club speed trials. 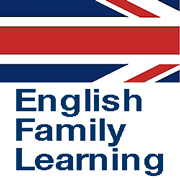 After serving through out the 1914-18 war as a Captain with the Royal Engineers for which he was decorated with 1914 Star, Military Cross and Médaille militaire he forged a successful career as a broker in the City of London. 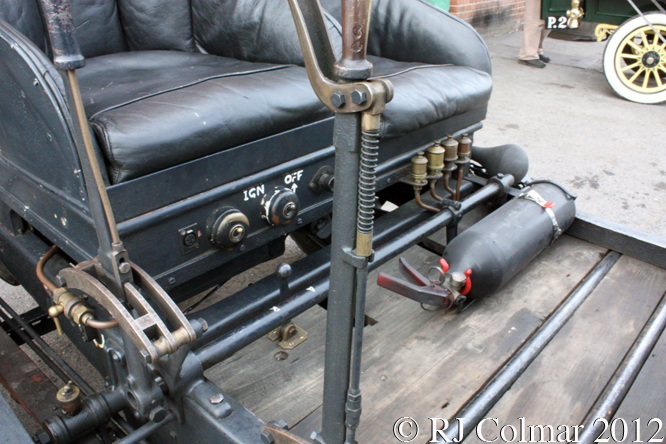 C.G., as he was often referred to in the contemporary press, also tuned a Schneider raising it’s top speed from 55 mph to 72 mph before buying a 1913 Grand Prix Peugeot which he named “Laura”. 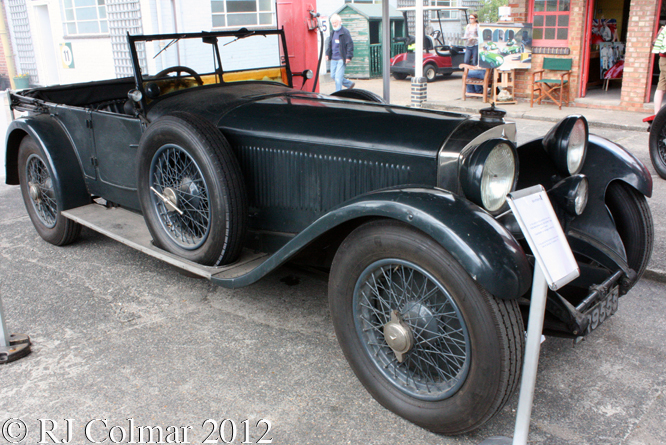 He was to accompany Captain James Algernon Toop, formerly of Home Counties Divisional Supply, as passenger aboard the Peugeot for a race at Brooklands in 1924, but elected not to in order to save weight, Capt. 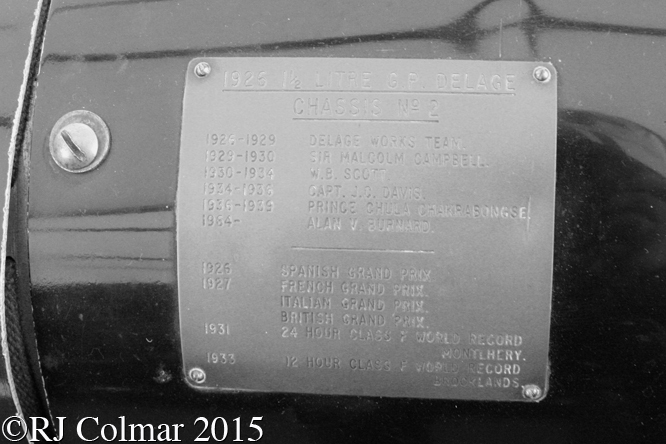 Toop was killed while racing for lead when the Peugeot went over the Brooklands banking. C.G. 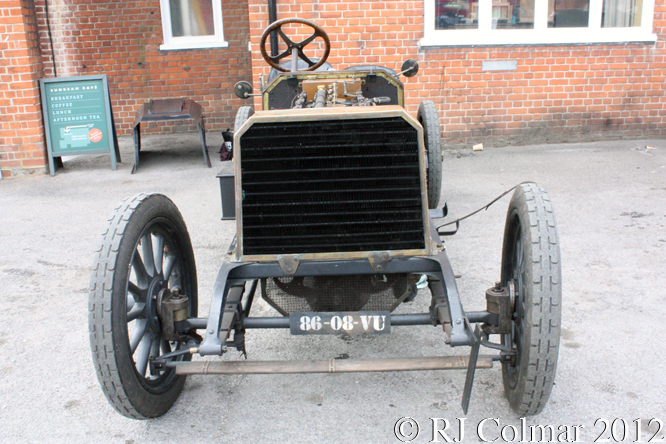 Brocklebank also briefly owned the 1914 Mercedes Benz with which Christian Lautenschlager won the 1914 French Grand Prix. 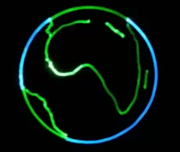 On the 28th of February 1928 C.G. 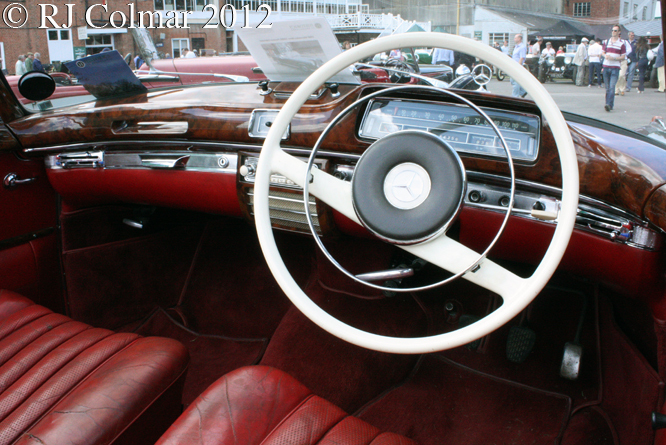 ordered today’s featured Mercedes Benz 36/220, it was delivered sans body on April 13th the same year for Cadogan Motors Ltd. to create and fit the lightweight fabric-skinned body. 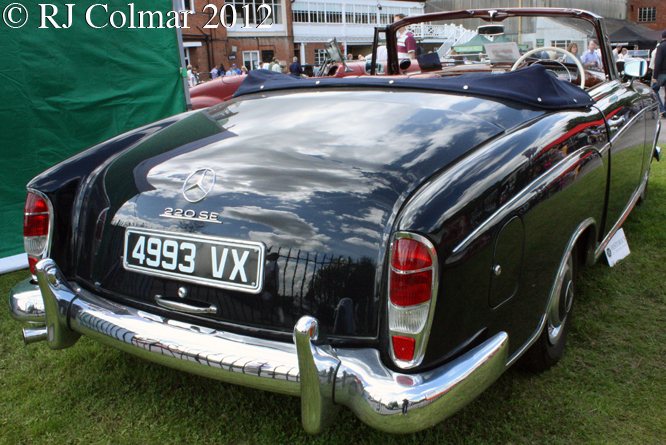 #35906 was registered for the road in the UK on the 22nd of May 1928 and C.G. had a tailor made motor house erected to accommodate it at his property Giffords Hall, Stoke-by-Nayland, Suffolk. 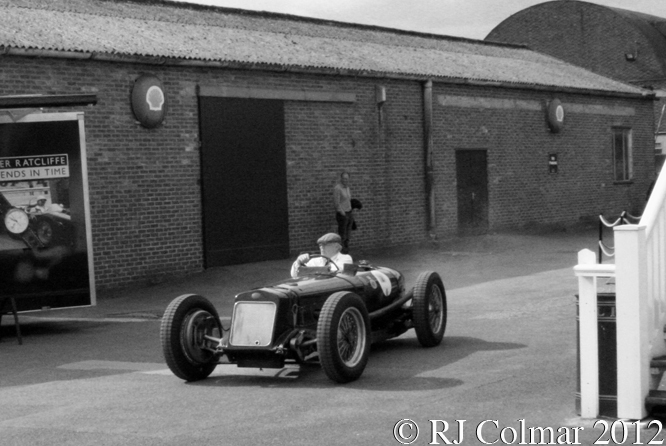 Upon his death in 1940 C.G Brocklebank’s son inherited the car and kept it in the same tailor made motor house where it remained until C.G Brocklebank’s grandson inherited it. 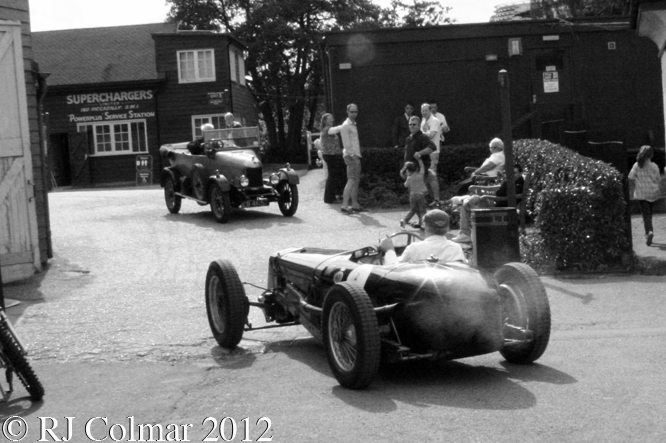 When the grandson disposed of #35906 in 2012, after 84 years ownership in a single family, it was still in running condition showing just 8,375 “probably genuine” miles on the clock, the car is seen in these photographs at the Brooklands Double 12 meeting prior to it’s sale at auction for £2,801,500 including buyers premium. 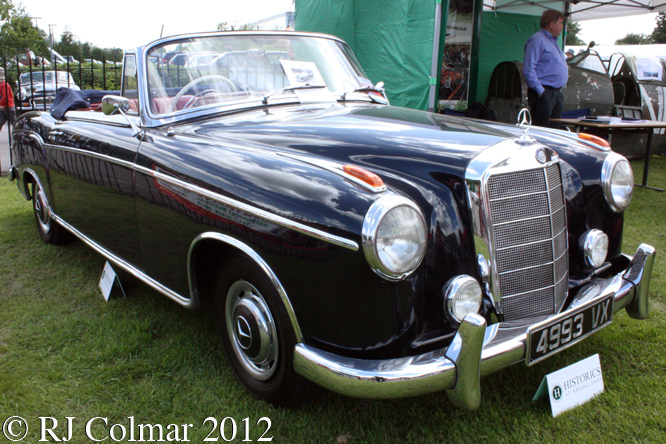 My thanks to Tim Murray and Richard “Vitesse 2” Armstrong at The Nostalgia Forum for helping me to identify C.G. 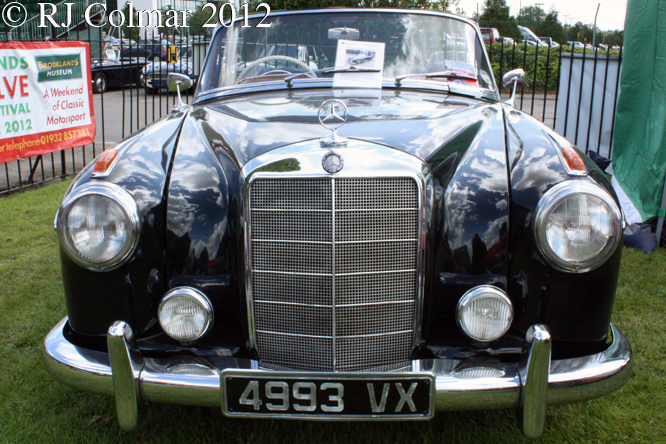 Brocklebank as the original owner of today’s featured car. 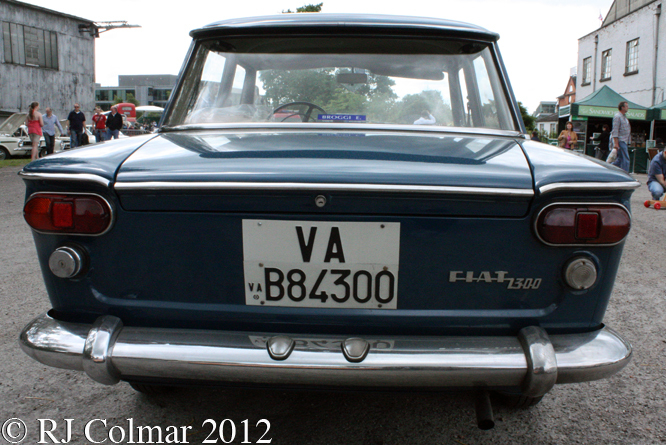 Thanks for joining me on this “Tailor Made Motor House” edition of “Gettin’ a li’l psycho on tyres” I hope you will join me again tomorrow when I’ll be looking at a Matra Simca. Don’t forget to come back now ! 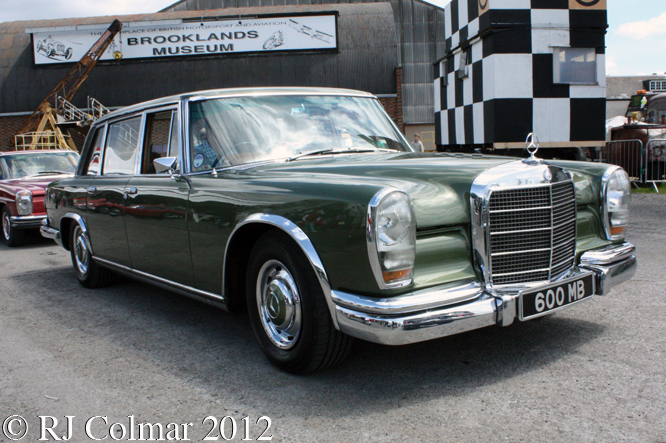 This entry was posted in Uncategorized and tagged 220, 36, Benz, Bonhams, Brocklebank, Brooklands, Colmar, Double, Mercedes, Psychoontyres, Ralph, Twelve on November 9, 2015 by Ralph. 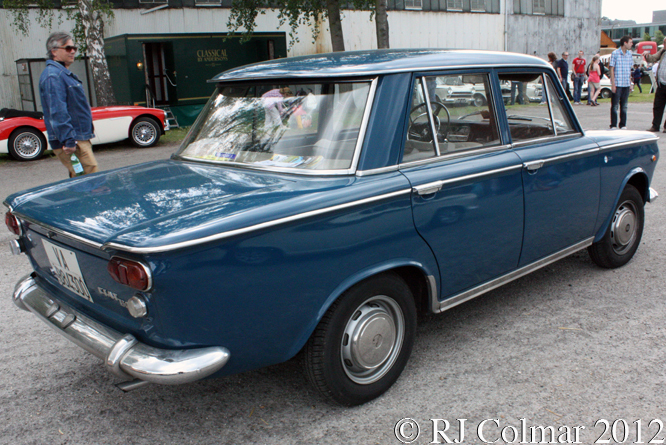 The 60hp FIAT 1300 Berlina replaced the FIAT 1200, the chassis of which was used for the 1200TV, in 1961 offered with a price of Lira 1,190,000 (Italian Lira one million one hundred and ninety thousand with and identical version with a larger 73 hp 1500 cc / 91.5 cui motor offered for Lira 1,250,000. 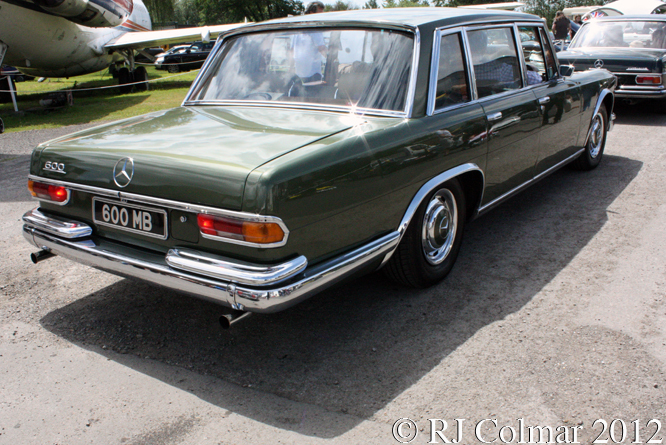 The 1300/1500 range, marketed with an elegant modernity strap line, included estate / station wagon along with 2 door Coupé and Cabriolet versions which were fitted with the 73 hp motors only. 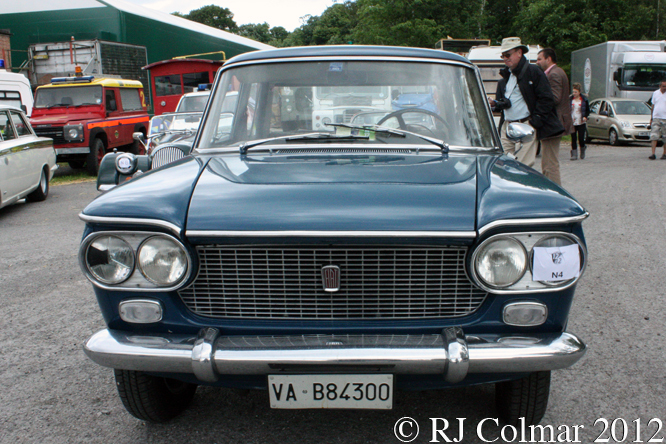 FIAT 1300’s, like the example seen here at a Brooklands Double Twelve meeting, were fitted with all synchromesh four speed transmissions and were early adopters in this class of disc brakes all round. 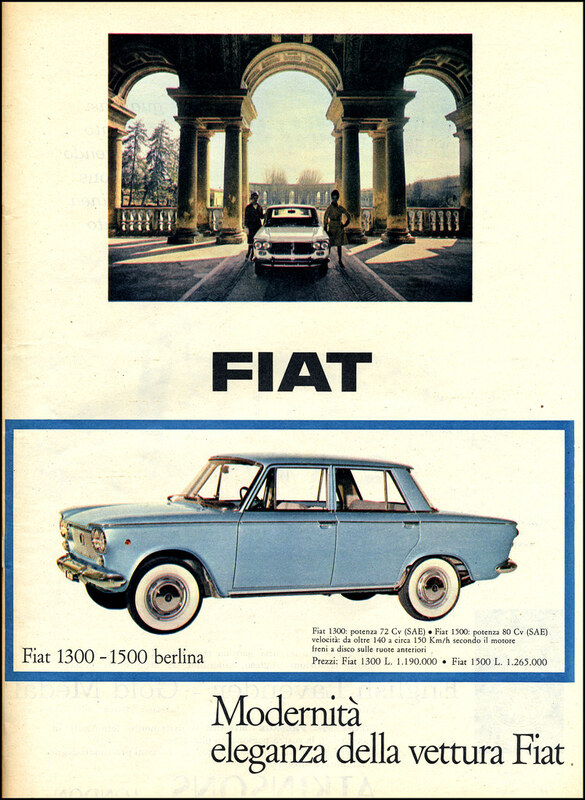 The 1300/1500 range was also produced by Zastava in Yugoslavia where the Zastava 1300, also known as the Tristać, production continued until December 1979, twelve years after 1300/1500 production had ceased in Italy. Fans of Italian Comedy might remember a FIAT 1300 being abused in the 1966 film Operazione San Gennaro see from 1:25:30, in which Armandino Girasole detto Dudù the character played by Nino Manfredi terrifies his side kick Sciascillo played by Mario Adorf on a trip to Naples airport. Thanks for joining me on this “Operazione San Gennaro” edition of “Gettin’ a li’l psycho on tyres” I hope you will join me again tomorrow when I’ll be looking at a Comet. Don’t forget to come back now. 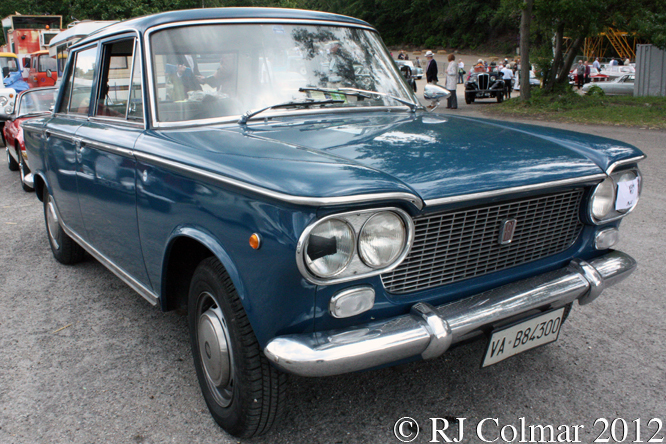 This entry was posted in Uncategorized and tagged 1300, Adorf, Berlina, Brooklands, Colmar, Double, Fiat, Gennaro, Manfredi, Operazione, Psychoontyres, Ralph, San, Twelve, Zastava on May 8, 2015 by Ralph.